Location : Australia QLD /White Seal! It's so gooood to come out of school of Friday, and come home to free stuff! <3 Ahaha, definatley goingg ! Today's Friday still no party yet. I know! When will it start? Maybe it'll start when school normally ends. . .
No party! So sad . I woke up at 9:00 for this. awesome party items !! 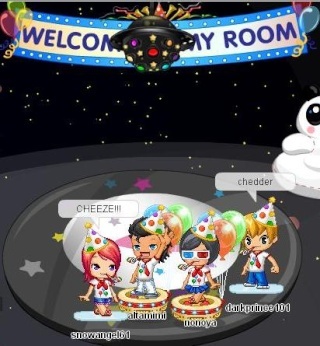 all partying =D & here's a small party at my place . Does anybody know where you can get the board? I love the sound of the whistle thingy. It's one of my favorite items. I got the board last night! I love my whistle. . . I have jumped and waved at least 100 times since yesterday!